At least 57 people died yesterday, including an eight-month-old girl, suffocated by tear gas. Today more clashes are expected. Criticism and concern from the international community. The US is blocking a UN declaration calling for the opening of a "transparent" investigation. 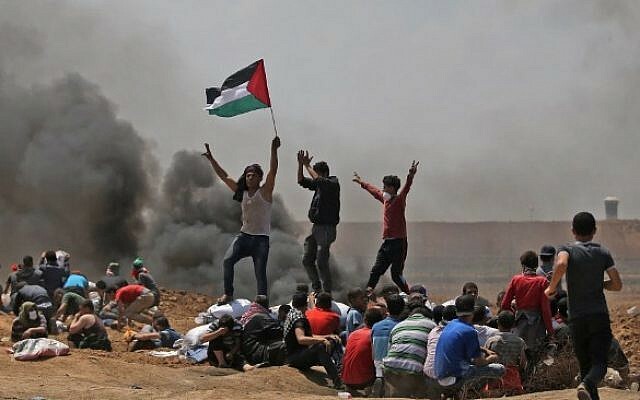 Jerusalem (AsiaNews / Agencies) - The Israeli army response to demonstrations against the new American embassy on the Gaza border killed 57 people yesterday and wounded several thousand. The youngest victim is Leila al-Ghandur, an eight-month-old girl who died from inhaling tear gas. It is unclear how far the child was located from the barbed fence between Gaza and Israel. The situation in the Gaza hospitals is critical, even in the main structure of the Strip, the Shifa hospital. In Gaza, the health system has been on the brink of collapse for months. Only yesterday there were about 2,700 wounded: at least 1,113 from firearms, 30 serious and 70 in grave conditions. Meanwhile, the Palestinians are preparing for the March for Return. Today is the "Nakba Day", which marks the anniversary of the day when the first Arab-Israeli war broke out, during which some 700 thousand people were expropriated from their land. Since then, Palestinian refugees throughout the Middle East have demanded the right to return to their ancestral lands. There have been various and varied reactions from the international community to yesterday’s bloody events. In immediate defense of its Israeli ally, the United States blocked a UN Security Council statement proposed by Kuwait, which included a condemnation of the killings and the opening of a "transparent" investigation of Israel's actions at the border with Gaza. The US accuses the Palestinian Authority of the Strip, Hamas, of being responsible for the deaths because "it intentionally and cynically provokes this response [of Israel]". The declaration by the UN Head of Human Rights, Zeid Ra'ad al-Hussein, condemned the "shocking" killings and injuries "by Israeli fire," adding that "the right to life must be respected" . Also from the UN, the Committee for the Elimination of Racial Discrimination said it was "alarmed by the disproportionate use of force demonstrated by Israeli security forces against Palestinian demonstrators". Turkey has accused the US of being as responsible as Israel for the "vile massacre", and has announced that it will withdraw the ambassadors from both countries. South Africa has taken a similar position- critical of Israel since the time of Nelson Mandela – withdrawing its ambassador from Tel Aviv, condemning "the indiscriminate and grave manner of the latest Israeli attack". In its statements, Egypt did not mention the new American embassy but condemned "the use of force against peaceful marches". On the European front, the representative of the European Union Federica Mogherini intervened, asking Israel to respect the "principle of proportionality in the use of force" and "respect the right to peaceful protests". The United Kingdom has defined the widespread use of live fires as "extremely worrying", while adding that the protests must be "peaceful". Germany has supported Israel's right to defend itself, stating that this must be proportionate. From the Élysée, the president of France Emmanuel Macron condemned the violence of the Israeli army.